While doing my PhD dissertation writing, a much more solitary endeavor than fieldwork, I realize how much my one-year of anthropological research in Jaipur, India as a Fulbright Nehru Student Researcher was filled with the joy of companionship in many forms. As much as I had hoped to make friends, find guidance through new teachers, and collaborate with tailors in Jaipur, I had also braced myself for a year of loneliness. I thought I would feel an isolating split between work-related social exchanges and then the necessary academic assessments running through my head and onto the page. I should not have been surprised when Fulbright orientation acquaintances quickly became familiar friends through our Hindi study with the supportive teachers at AIIS. My host family, spanning four generations in one household, anchored me with their home cooked food, smiles, and hugs. At my affiliated institution, the University of Rajasthan, Department of Anthropology, Dr. Bela Kothari, always met my enthusiasm with her own. Even if weeks had gone by, our suspended conversation would continue seamlessly as she shared with me yet another tailoring lead, question to consider, or insightful point of view. Dr. Kothari also introduced me to her dedicated student, Surendra Singh Shekhawat who became my steady research companion. Surendra had fieldwork experience and a Master’s degree in Anthropology. I came to know that he possesses a curiousity and readiness to delve into almost any topic, especially if the process involves getting to know people. What began as a few visits to meet some of his tailoring “knowns” grew organically into a full research partnership. Surendra explained our project on “Jaipur Tailoring” in Hindi in a way that I still can’t express in English. His respectful kindness in talking and listening to people, along with my intermediate Hindi, seemed to help participants feel at ease. We worked together to build warm, trusting relationships, the kind that we both knew to be essential to good research, and one of life’s pleasures in general. 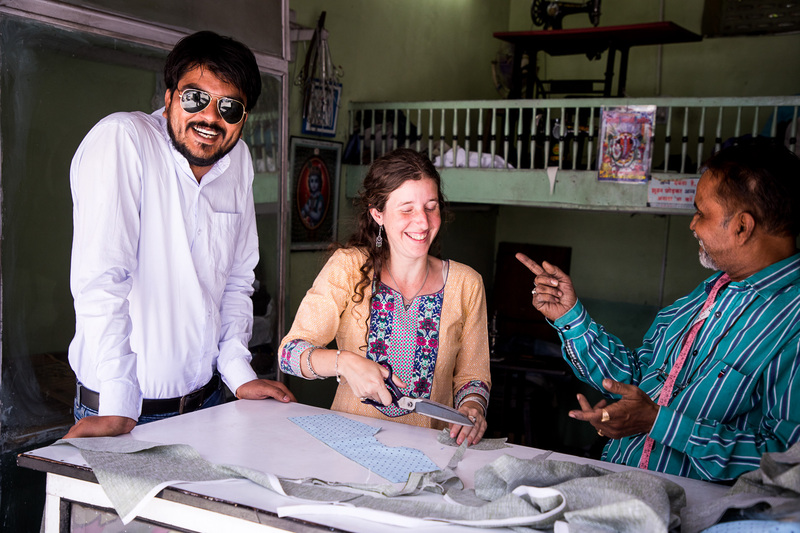 Surendra and I spent time getting to know more than forty tailors, but our closest connections are with three working Masters, who we refer to affectionately as our Guru Jis. Dilip Ji, taught us how to cut and stitch ladies clothing. Pradeep Ji, taught us gents pants, shirts, and how to flawlessly alter the hems of jeans. Anita Ji, my dearest confidant, would call herself a turpaiwalli, but she is a Master of turpai, in her own right, which are the techniques of hand hemming and finishing work. Under the watchful eyes and guiding hands of our teachers, we drew chalk lines, cut cloth and stitched clothing. 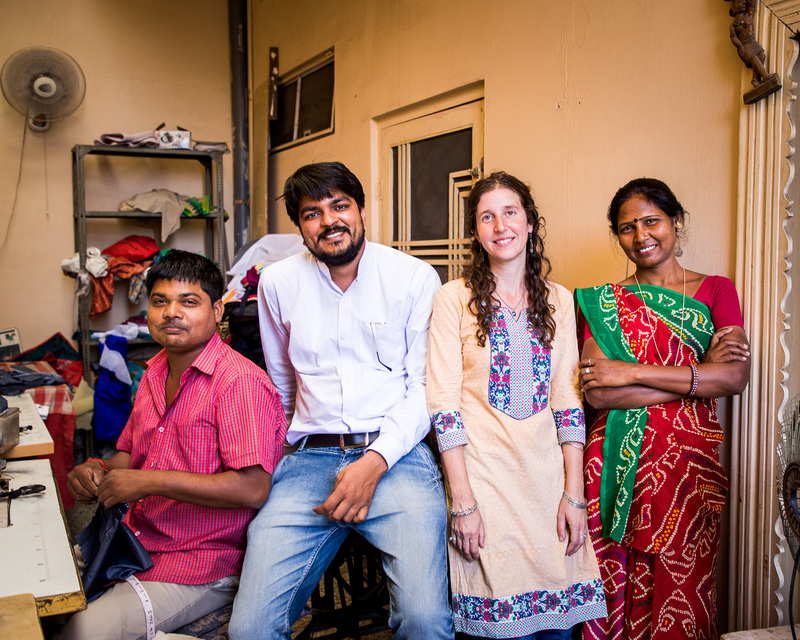 Surendra and I also visited tailors in their homes for chai, meals, and eventually longer in-depth interviews. We became so in sync that without any discussion, I found follow up questions popping up in my head in silence, come out in sound through Surendra’s voice. For ten days, we expanded our collaboration to include a brilliant Irish photographer, Mark Nixon, fulfilling my hope that the words I write will have their own stunning visual companionship. While we did research on tailors in Jaipur, they were doing research on me. Are there tailors in America? Are there trains? How much is rent? Do people there eat roti? While I was concerned about their struggles to earn a living wage, they often shared their own concerns about my being exploited as a foreigner. They knew I had the financial security of a scholarship, yet they still asked, Alisa Ji, you paid how much for that? When I was overcharged even two rupees for thread or ten rupees for elastic, Dilip Ji had words with the shop owner. Their ability to read and comment on my facial expressions and moods brought support and humor to any discomforting moments. Contrary to what people might think, there is nothing “simple” about tailoring, and our days were filled with highs and lows. They studied me not to earn any educational degree, but because they cared for me. Had I eaten enough? How many rotis? And why, why, why was I always thinking so much about everything? Dilip Ji liked to say that Anita Ji and I are of the same rashi, meaning we are astrologically linked because our names both start with the “Ah” sound. The clinching proof he found is that we both worry a lot. My tailoring friends, Sadik and Tender, often laughed at me when they realized they said something I wanted to write down, calling out “entry” as I reached for my diary and pen. We also liked to make up stories about when they will come to America. The number of rooms in my house, the boutique we will open, the work we will do. For sometime the idea held some traction. Yet, when I finally admitted that generally speaking, most Americans do not eat roti daily, all deals were off. When I talk with these close friends or any of the many unknowns who might approach me with questions as I go about my daily life in Jaipur, I am reminded of my privilege to move around the world, to seek answers to my questions, to learn. I do not feel uncomfortable, stared at or harassed. Aren’t I the one who is looking with deep and wondering eyes? For those who may never have the opportunity to leave their own country, I am that tiny piece of America who has reached them. I hope they find my America as welcoming and companionable as their India is to me. Thank you for sharing. Would you be able to share an email address for Prof Bela Kothari? I am unable to find her email address online. Great article thanks for sharing i am very glad to read this thanks for posting good work. This is wonderful, Alisa. You have such amazing insight, warmth and curiosity. We should be so lucky as to have all of the ambassadors from our country share similarly the wonder of other cultures and lands.